It’s time for action! There’s loads children can do with HABA’s Play Cubes Dragon Duri & Mouse Merle, stacking is just the beginning! Delightful colors, fascinating surfaces and plenty of distinctive features stimulate babies’ senses. 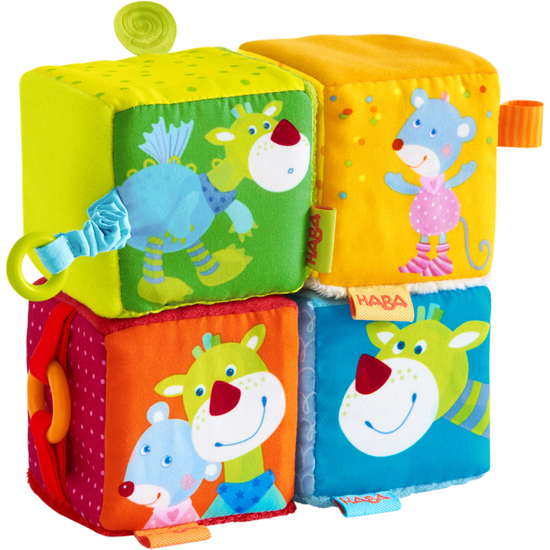 They train their fine motor skills with the orange cube, the red one’s crackling perks up their ears, the blue cube’s mirror foil lets them explore themselves and the green one excites them with its clatter effect.